Carl M. and Carole Anne Albero’s relationship with St. Mary’s Home began about a decade ago with a visit from a nun. Sister Mary June Morin went to AMSEC, a defense contracting company founded by Carl Albero, a former Navy captain, to talk about St. Mary’s. 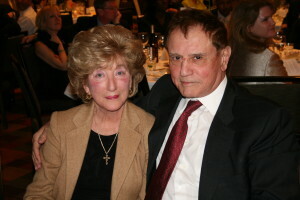 Albero was so impressed with Sister, who retired in 2011 after more than 50 years of service to children at St. Mary’s, that he had the company adopt St. Mary’s as its charity. AMSEC continues to donate toys to the children each year during the holidays. As a member of St. Mary’s Board of Directors, Albero became more involved with St. Mary’s when the Home was raising funds for St. Mary’s main building, which opened in 2005. That led Albero and his wife, a former special education instructor who volunteers at the school at St. Mary’s, to look for other ways to support the children — including making the lead gift to build a wing that will have room to care for up to 12 adults. The Albero House for adults at St. Mary’s Home opened in summer 2013. Albero also plans to continue supporting the children by remembering the Home in his will as a founding member of The Guardian Society, the planned giving program at St. Mary’s. If you make a planned gift to St. Mary’s by the end of 2014, like Carl and Carole Anne Albero, you will be recognized as a founding member of The Guardian Society. For more information, please contact Martha Price Stewart, director of development, at (757) 446-6797, (800) 237-6555 or mstewart@smhdc.org.